Well this was a dream come true for me. 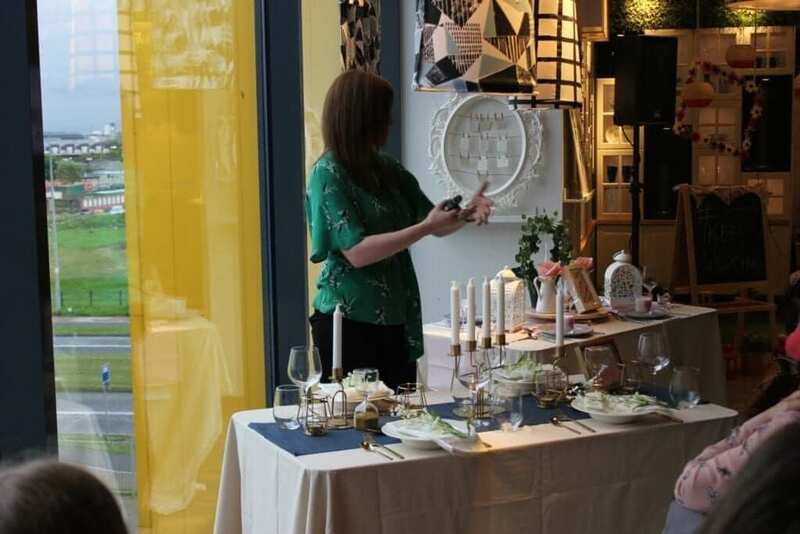 I was pretty much given free reign of IKEA Dublin to create some wedding masterpieces for 80 lucky family card members. I literally had to pinch myself as this is really my happy place. 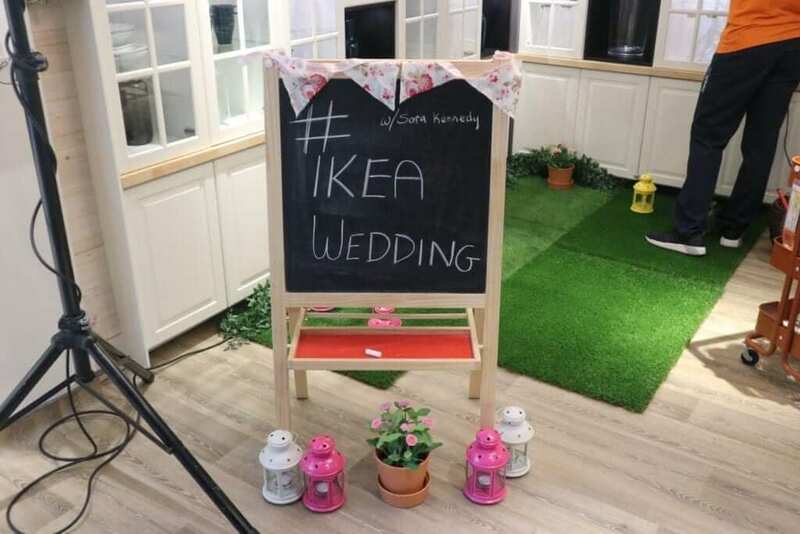 I built my own wedding on IKEA and to be given the opportunity to do this event was just beyond what I could imagine. There was no worry about not having enough ideas, I had too many and had to leave behind some. I wanted to created various scenes throughout a wedding day. I wanted the ceremony, arrival reception and dinner to be covered. I wanted a pretty backdrop that could be used both indoors and outdoors. 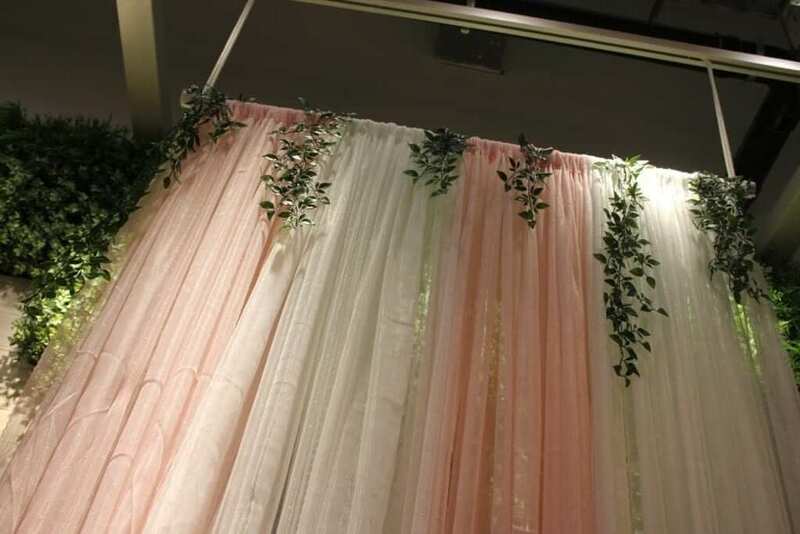 I used pink and white Hildrun curtains and we took some Fejka ivy and clipped it out of its pot. It was hung from a curtain pole. The table in front of the backdrop had some key ceremony pieces displayed. 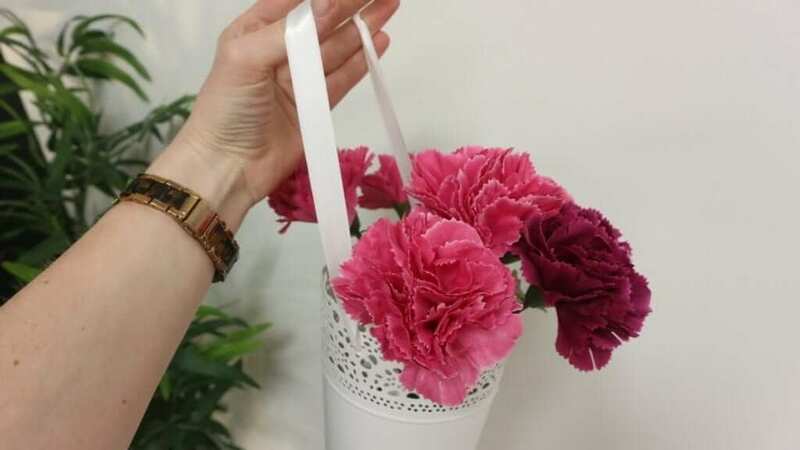 I used 12 of their dark and light pink artificial flowers to create a bouquet. I picked up some ribbon and pins from a sewing shop. IKEA have a lovely mini green house. I took that, stuffed with artificial greenery and then hung the word ‘Cards’ on the outside. This makes a lovely card box on the day. 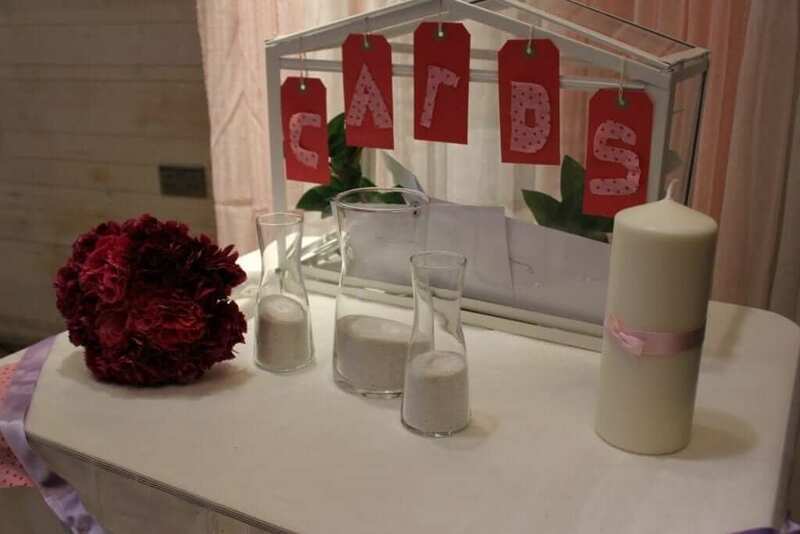 I had the sand ceremony set up using Tidvatten – you can get small and then a large version, I had the two smaller jars to represent the bride and groom individually and then one larger to represent them joined as one. One of my pet peeves is the cost of eternity candles. 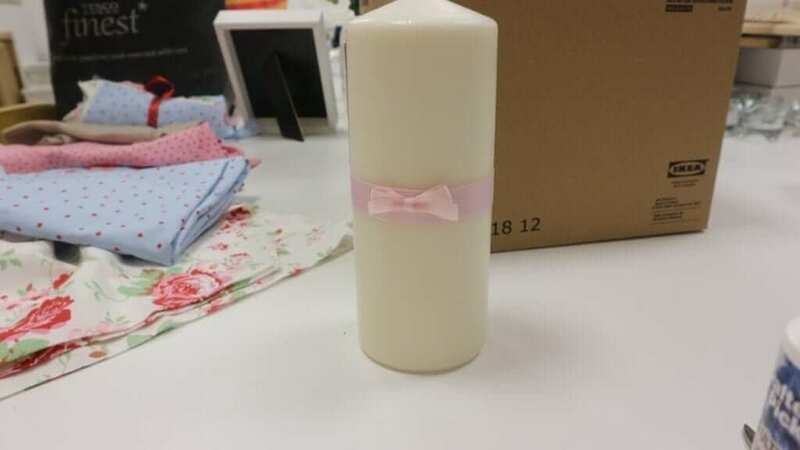 I took a pillar candle (Fenomen) and you could take x2 long candles for the individuals. I sourced ribbon and and a bow embellishment from my local sewing shop and used craft glue to bring it all together. Before the event, I nipped in store to pick up some fabric. IKEA has a great deal at the moment, €3 per metre on certain fabrics. I bought 4 different types plus some that looks like hessian. Between myself and my mum, we sewed some bunting together using the material and some ribbon. This was draped across the ceremony table. An aisle was created and I offered 3 looks. Using some glass jars, ribbon and and artificial rose, I created one pew end. Next, I took the very popular skurar pots and looped ribbon through and again added some artificial flowers. Finally, using the rotera lanterns, I looped some ribbon again and suspended from the edge of the chair. 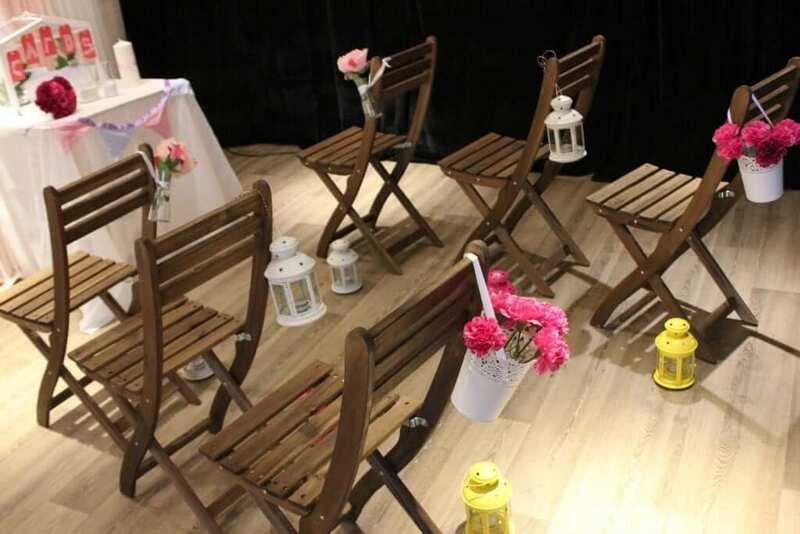 A mix of rotera lantern colours lined the aisle. This is where you can have some real fun when it comes to DIY. 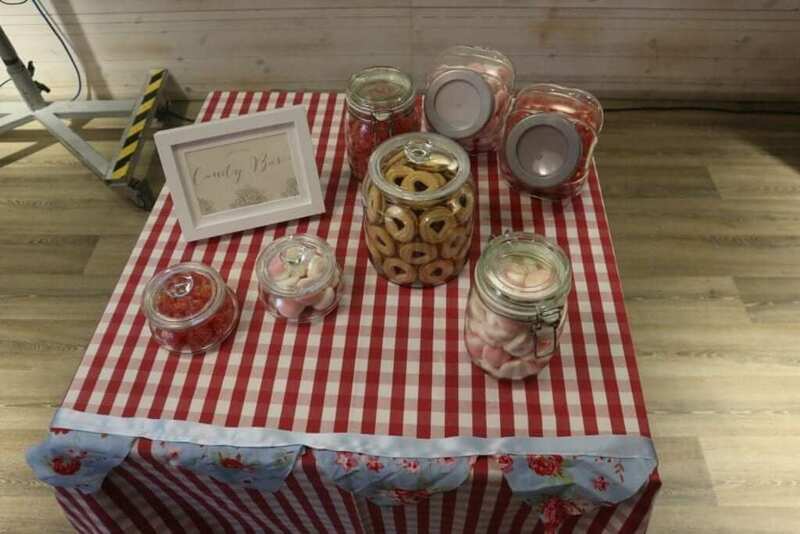 I took one of their trolleys that you can use for your vegetables and laid out a fizzy station for guests to enjoy. I took some of the jars in the kitchen ware department and put strawberries in to enjoy. IKEA are pretty much iconic for their glassware and I just picked up a selection of jars and we used the pick & mix from the shop in IKEA. I used the checkered fabric to cover the table and then added more of my home-made bunting. This created quite a stir! Everyone flocked to it and I was asked by many how I made it. I just took a plain white frame and some artificial flowers and glued them on. I’ll have the full how to coming out in Cork Wedding Magazine in a few weeks time. 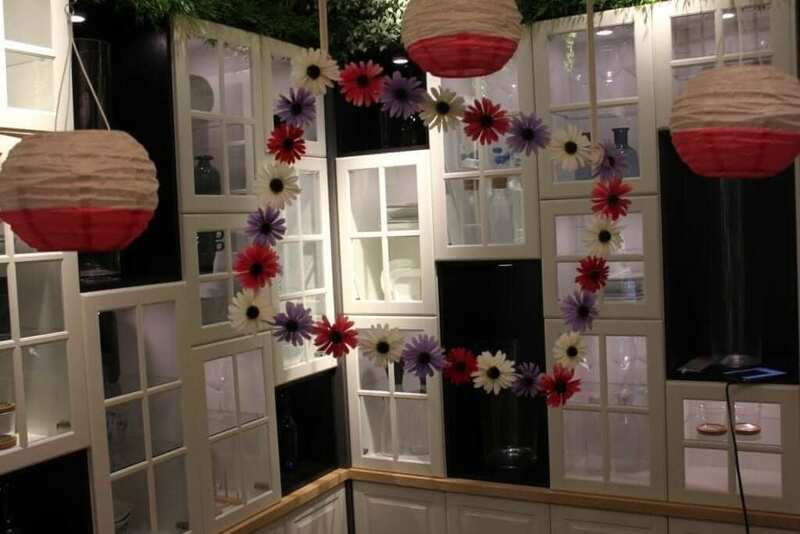 I wanted this frame to be a central point in a garden but when a venue doesn’t have a garden….lets create one! Using the artificial grass, ivy and potted plants from IKEA, I created a an in-door garden. I brought my own props and they are easily sourced in various retailers throughout the country. You couldn’t have this event without recreating some reception looks. I created some table plans and 2 key table looks. 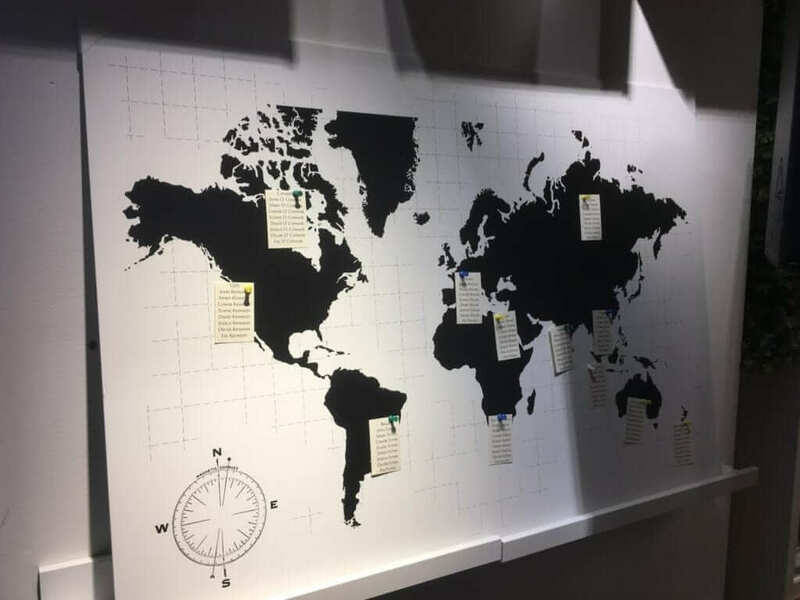 Map of the world: Using the Molltorp map of the world blackboard picture, I named each table after a place in the world that the imaginary couple may have travelled to. Using normal pins, we hammered each table plan on to the specific location. 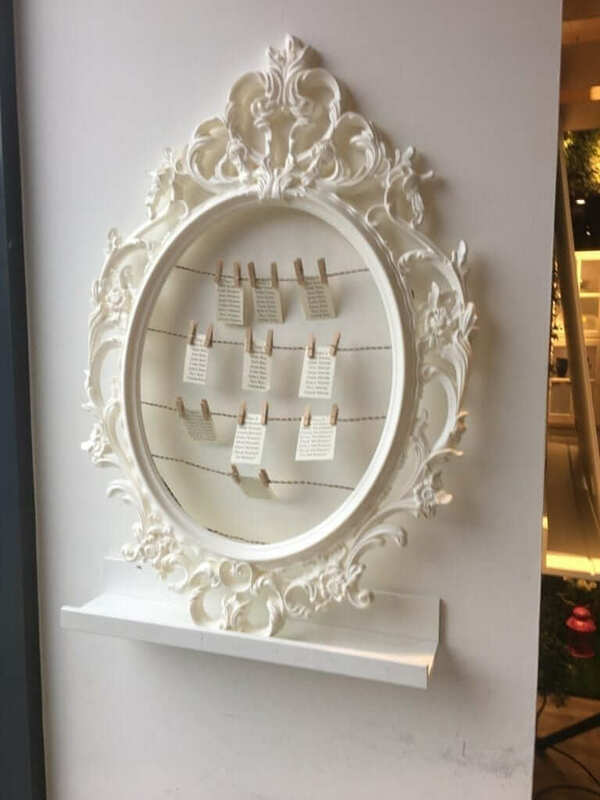 Picture Frame: Using Ung Drill picture frame and some twine, I removed the glass and backing, ran the twine through and using mini pegs, hung up each table plan. I took IKEAs wooden moveable table centrepiece and added a the circular ivy plant and hung the table number from it. Taking some of the material used in my bunting, I cut out table numbers and mounted them in to a frame. I love the white milk jugs in IKEA so I very simply added them to the table and popped in an artificial rose. On both sides of this centrepiece, I added white ornate lanterns. I scattered some tea light holders throughout the table. I also took their love heart candles and used as favours. This was my favourite piece and so many have complimented me on this set up. 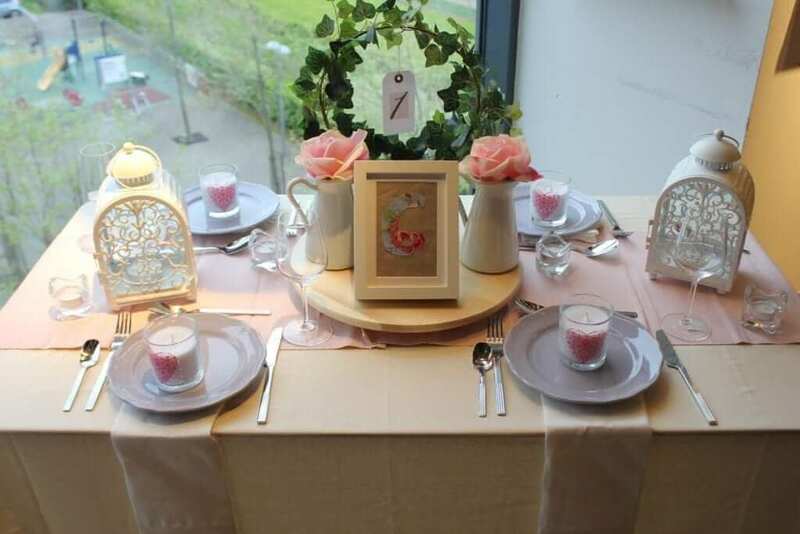 It was adored by not only wedding couples but those who just like a good old table set up! I took their petrol blue table runner to give definition to the central line of the table. All other crockery and linen where neutral to allow the gold to pop. Using the Parlband collection, I took candelabras and candle holders to shape the lighting on the table. These pieces are so ornate and almost look like they belong on an alter! I took a gold picture frame for the table number. Using some artificial baby breath, I added a spring per table table setting. 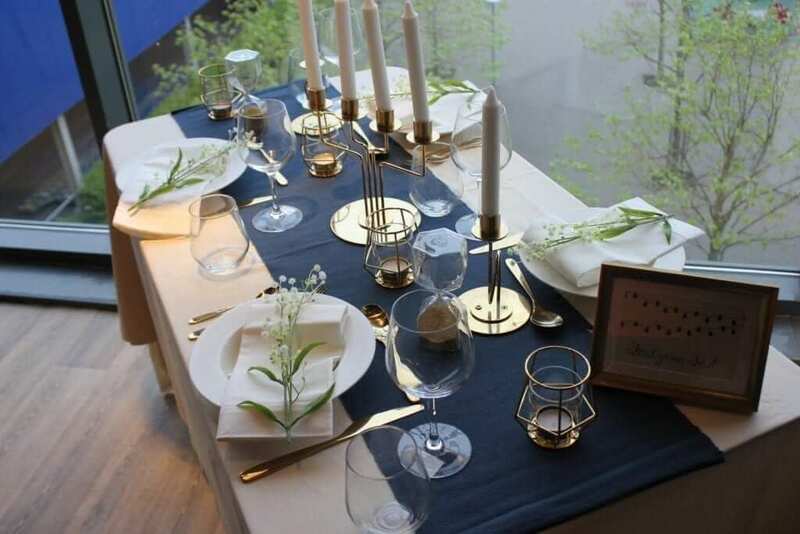 To finish the look, I used their gold knives and forks….I am definitely picking up a set of these for my own entertaining. The evening was a huge hit and I am so thankful to everyone that came along. A huge thanks to Deborah, Marie, Dale, Charlotte and Aisha in IKEA. You guys are really the A Team! 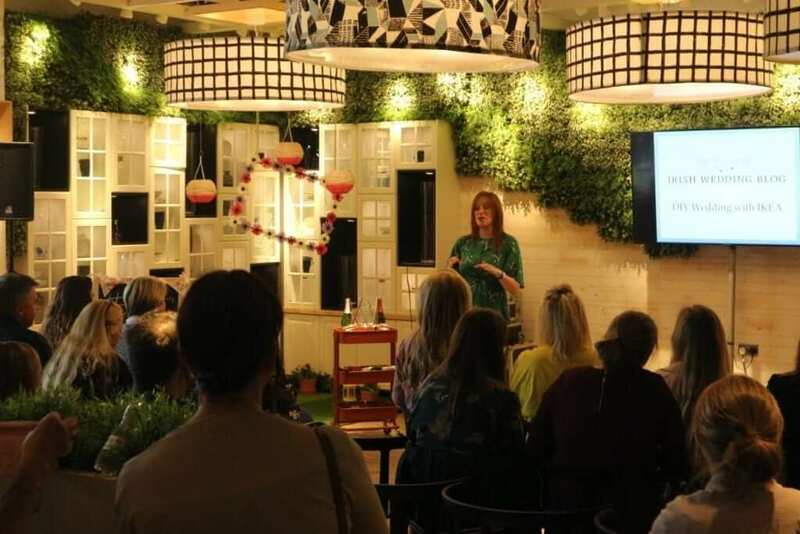 I can’t forget to thank my besties Sharon and Sandra for helping me set up…..I currently owe them a lot of Prosecco! Enjoy the pictures and just email if you have any queries on the stock used!